Who doesn’t like gooey-centred chocolates (does a person like this even exist?!)? I enjoyed caramels coated in crisp chocolate back in the day. They have a texture and taste that has long been out of my treats vocabulary though due to my food intolerances! So, how have I remedied this and what is my secret ingredient to do so?! Dates!! Recently, after a gentle and slow reintroduction, I have been loving small amounts of medjool dates. They are so delicious and gooey…and taste like caramel! 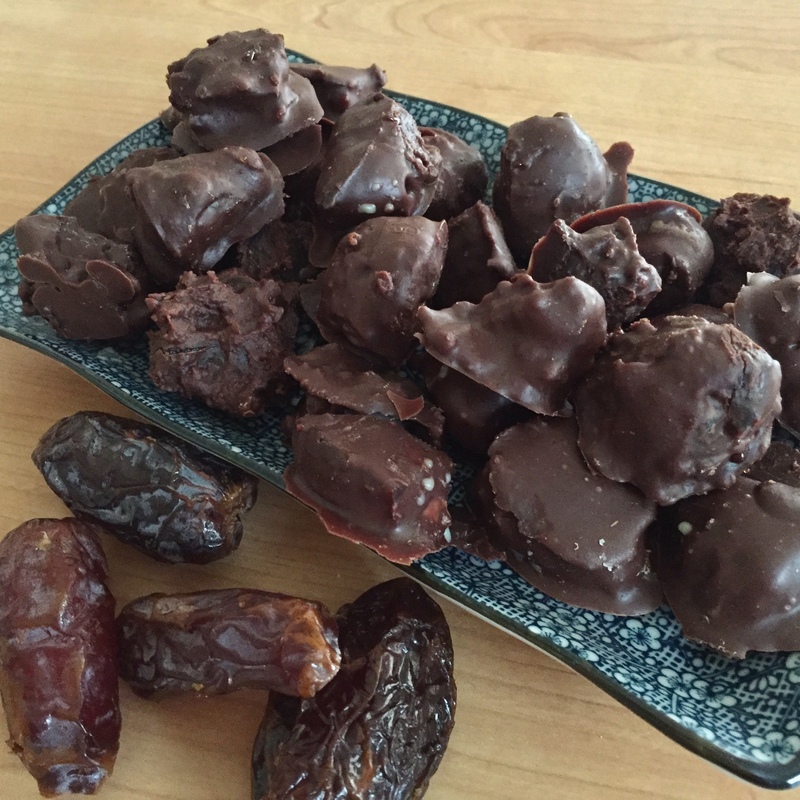 I was given some cacao butter at Christmas and it dawned on me – why not try making a dark chocolate and dip medjool dates in it? Oh how I’m glad I did! They seriously feel and taste like chocolate caramels. And as an awesome addition, there are so many healthy bonuses in this treat! the chocolates we buy at the shops, which means you get antioxidants, healthy fats, and benefits such as youthful skin, assistance with mood, improved immunity, decreased inflammation, and it even improves metabolism and digestion! Raw cacao powder comes about when the bean is ground and the fat content is removed. It does have similar health benefits to cacao butter, and has features such as high magnesium levels, and even has more calcium than cow’s milk, which is pretty great! Dates are also packed with important nutrients, minerals and antioxidants that can assist in preventing illnesses such as heart disease, diabetes and Alzheimer’s. They can decrease inflammation and help with bone health. There have even been studies that show they can decrease labor time if eaten in the last few weeks of pregnancy! Being a dried fruit, dates do have a high fructose content, which means you shouldn’t overeat them, whether you have fructose malabsorption or not. However, they are so sweet that you really do not need to eat much in one sitting to be satisfied. Even maple syrup has bonuses such as riboflavin, zinc, magnesium, calcium and potassium. It is a sugar so moderation needs to be put into practice (and it can be left out of this recipe), but it is considered better than white sugar. So, need I go on?! What’s stopping you?…make these healthy treats, which are super simple to make, asap! *The dates are very sweet so you may decide to not add maple syrup. *You could use dried Deglet Noor dates, which are cheaper and have less sugar. They are firmer and not as gooey or sweet as medjool dates. 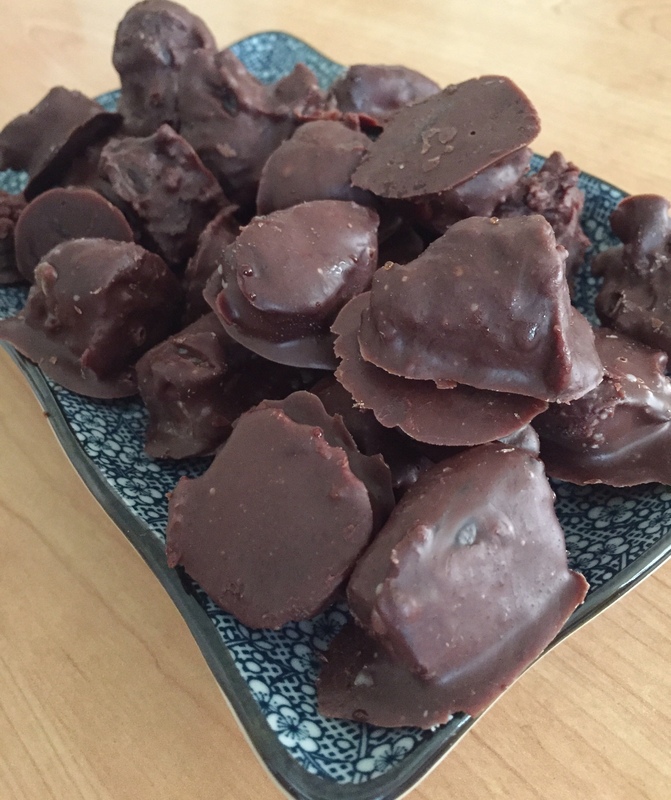 You could try soaking them for an hour or two and draining off the excess water before dipping them into the chocolate.